moves from the surface of Earth to the atmosphere and back to the surface again. Water Use Data about the amount of water people take from reservoirs, rivers, and lakes for use in households, businesses, agriculture, and power production is shown in Table 1. These actions can reduce the amount of water that evaporates into the atmosphere. They also can influence how much water returns to the atmosphere by limiting the amount of water available to plants and animals. Figure 10 The water cycle involves evaporation, condensation, and precipitation. Water molecules can follow several pathways through the water cycle. Identify as many water cycle pathways as you can from this diagram. 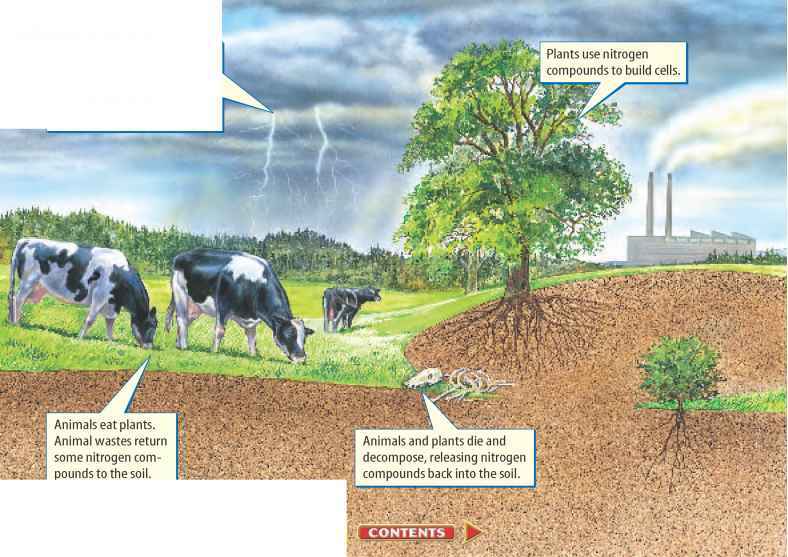 Figure 11 During the nitrogen cycle, nitrogen gas from the atmosphere is converted to a soil compound that plants can use. State one source of recycled nitrogen. The element nitrogen is important to all living things. Nitrogen is a necessary ingredient of proteins. Proteins are required for the life processes that take place in the cells of all organisms. Nitrogen is also an essential part of the DNA of all organisms. Although nitrogen is the most plentiful gas in the atmosphere, most organisms cannot use nitrogen directly from the air. Plants need nitrogen that has been combined with other elements to form nitrogen compounds. Through a process called nitrogen fixation, some types of soil bacteria can form the nitrogen compounds that plants need. Plants absorb these nitrogen compounds through their roots. 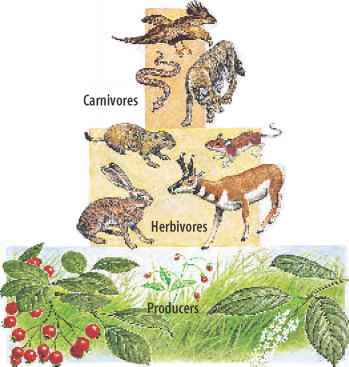 Animals obtain the nitrogen they need by eating plants or other animals. When dead organisms decay, the nitrogen in their bodies returns to the soil or to the atmosphere. This transfer of nitrogen from the atmosphere to the soil, to living organisms, and back to the atmosphere is called the nitrogen cycle, shown in Figure 11.
l^lEmtHTmEEji What is nitrogen fixation? Nitrogen gas is changed into usable compounds by lightning or by nitrogen-fixing bacteria that live on the roots of certain plants. 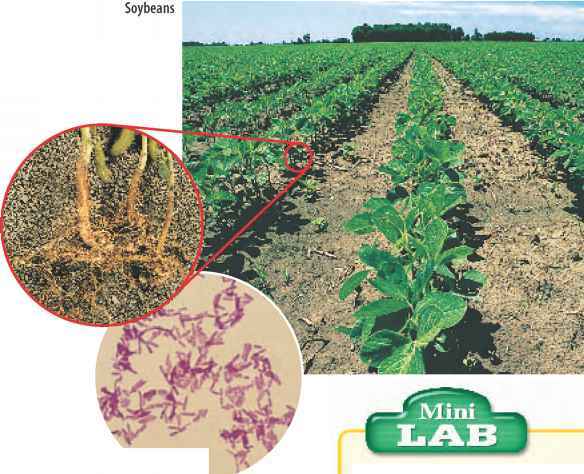 Figure 12 The swollen nodules on the roots of soybean plants contain colonies of nitrogen-fixing bacteria that help restore nitrogen to the soil.The bacteria depend on the plant for food, while the plant depends on the bacteria to form the nitrogen compounds the plant needs. Soil Nitrogen Human activities can affect the part of the nitrogen cycle that takes place in the soil. If a farmer grows a crop, such as corn or wheat, most of the plant material is taken away when the crop is harvested. The plants are not left in the field to decay and return their nitrogen compounds to the soil. If these nitrogen compounds are not replaced, the soil could become infertile. You might have noticed that adding fertilizer to soil can make plants grow greener, bushier, or taller. Most fertilizers contain the kinds of nitrogen compounds that plants need for growth. Fertilizers can be used to replace soil nitrogen in crop fields, lawns, and gardens. Compost and animal manure also contain nitrogen compounds that plants can use. They also can be added to soil to improve fertility. Another method farmers use to replace soil nitrogen is to grow nitrogen-fixing crops. Most nitrogen-fixing bacteria live on or in the roots of certain plants. Some plants, such as peas, clover, and beans, including the soybeans shown in Figure 12, have roots with swollen nodules that contain nitrogen-fixing bacteria. These bacteria supply nitrogen compounds to the soybean plants and add nitrogen compounds to the soil. 1. Examine the three numbers (e.g., 5-10-5) on the labels of three brands of houseplant fertilizer. The numbers indicate the percentages of nitrogen, phosphorus, and potassium, respectively, that the product contains. 2. Compare the prices of the three brands of fertilizer. 3. Compare the amount of each brand needed to fertilize a typical houseplant. 1. Identify the brand with the highest percentage of nitrogen. 2. Calculate which brand is the most expensive source of nitrogen. The least expensive.